Arrival in San Francisco Former British Royal Marine and intrepid adventurer Mick Dawson is the world’s most experienced ocean rower. 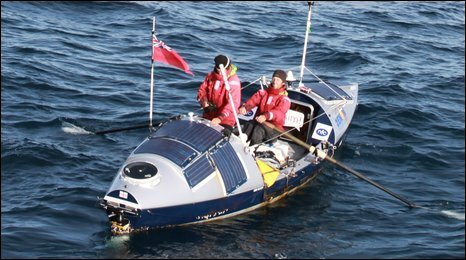 In 2009, Mick entered the Guinness book of world records as part of the first crew ever to row across the mighty Pacific Ocean from Japan to the Golden Gate Bridge, San Francisco. Now Mick is back in the US to reclaim Bojangles, his state-of-the-art ocean rowing boat from the San Francisco Maritime Museum. On Nov 10th 2011 there is a rare opportunity to hear Mick Dawson’s inspirational stories over dinner at the Golden Gate Yacht Club. Bojangles will be on display. Mick will also present his next adventure, the Olympic Atlantic Row. In a route never before attempted, he will set off in May 2012 to row across the North Atlantic Ocean into the heart of London for the start of the 2012 Olympic games. We would like to invite members of the local sailing and rowing community to join us for a fantastic evening. Places are limited. Tickets are $60 and include dinner. Please RSVP to Naomi Coe at naomi@olympicatlanticrow.com .